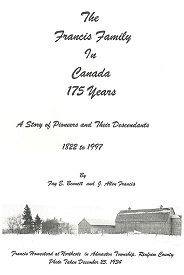 [S2] "Ontario Birth Registrations online at Ancestry.com", FamilyTree.Com, (Name: Subscription www.ancestry.ca;), # 030775 Bromley Twp., Renfrew Co., Ontario (Reliability: 3). [S728] Obituary of Elisha Francis, Temiskaming Speaker, (Name: Jun 1, 1950;). [S889] Vital Statistics of Ontario - Marriage registration of Elisha Stewart Francis and Annie Maria Toner. [S650] Marriage Certificate of Elisha Francis and Mary Ellen Francis. [S4] "Ontario Marriage Registrations online at Ancestry.com", FamilyTree.Com, (Name: subscription www.ancestry.ca;), Renfrew Co., Ontario (Reliability: 3).